The What: Middle Atlantic Products has expanded its FlexView Series line with new FlexView Series IFP display carts that incorporate device mounting and built-in power distribution. The new professional display carts are engineered to support IFPs and larger displays ranging from 60 to 102 inches with a large VESA mounting and a weight capacity of up to 300 pounds, accommodating even the 84-inch Microsoft Hub. The new FlexView Series IFP display carts will be on display at InfoComm 2018 in Legrand’s booth C3683. The What Else: The new display cart lineup is available in a wide array of colors, with optional finishes in high-pressure laminate (HPL) colors including new textured, metallic HPLs, to allow presentation, collaboration, and digital signage technology to blend into surrounding environments and to serve a broader range of customer AV needs. With these options, the series can correspond with preconfigured technical furniture solutions, enabling cohesive designs for any learning or meeting space. The Flexview expansion offers both fixed and height adjustable solutions. The height-adjustable cart models are equipped with the company’s e-lift feature and comply with ADA regulations (section 308) regarding reach ranges. 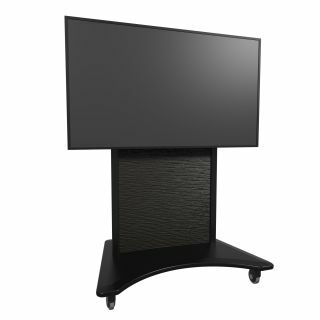 The height adjustability from 40 to 60 inches to the center of the display is paired with a scalloped base, which ensures unimpeded access for interacting with the screen up close and at the desired ergonomic setting that’s comfortable for each user. The Bottom Line: The system design optimizes each cart model for maximum uptime and reliability with premium storage, passive thermal management, and 8 outlet power distribution with surge protection, according to the company. FlexView Series IFP carts provide equipment storage with 2RU vertical mounting and a removable, tool-free Lever Lock for small-device mounting. Heavy duty, locking four-inch casters make mobility easy, and the carts’ UL rating ensures the safety of the solution. Accessory camera mounts and soundbar brackets are available as enhancements, as are leveling feet that allow users to quickly convert a cart to a stand.